Some would have thought that going to Samar is an adventure, but they are wrong if they spend time at the rock formations. Like other coastal towns in Eastern Visayas that offer natural wonders, Marabut town boosts its rock formations that look like towers waiting to be visited through island hopping, swimming, snorkeling, diving and even rock climbing. But what makes the destination distinctive is its peaceful surroundings. The site is part of the Tandaya Trail under the Spark Samar tourism campaign of the provincial government. 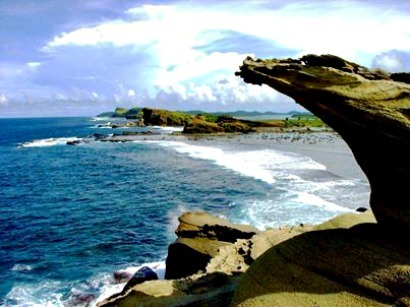 Marabut town, one of the tourism ready places in Samar province is included in the forefront of the tourism campaign. Just about an hour drive from Tacloban crossing San Juanico Bridge, this town is adjacent to Basey and near the border of Eastern Samar province. The rock formation serves as markers as visitors would be able to recognize if they’re already in the vicinity of Marabut town. Rock formations in the middle of the sea are concentrated into two groups with 15 islet rock formations called Kapuroan group near Osmena village that has white sand beaches ideal for swimming and scuba diving and the Madung-badong group about 10 kilometers away from Kapuroan. The bigger rock formation in Madung-badong has a cave with a lagoon inside that can accommodate a family event. The Tooth also forms part of Madung-badong group of islets. Madung-badong rock formations were already featured on national television through a segment in a former television show of Regine Velasquez. There are rocks formation that can also be found in Tinabanan village that locals tagged as Tinago Enchanted Lagoon where there are cave and lagoon that are ideal for rock climbing and family gatherings. Marabut rock formations are not hard to access as they are located just several minutes away from the coast line via pump boat. Another attraction in this town is the 16th century Parola or lighthouse, built during the Spanish era and reconstructed after it was damage during World War 2. This is the only lighthouse built on top of a volcanic rock. Just like Basey and Tacloban, Marabut was severely devastated by super typhoon Yolanda, but its tourist destinations remain intact and were not damaged by the strong winds. About a year and five months since super typhoon Yolanda struck, Marabut is slowly getting back on its feet. Accommodation facilities that were destroyed by the typhoon started to operate again, offering their best to satisfy their guests. Rock formations are again covered with green vegetation and wild monkeys have started to be seen climbing them particularly in the rock formation near Caluwayan Resort. For beach goers, they may take a swim at the beach in Pinamitinan village or have an option of getting wet at the less popular waterfalls in Samar Island, the Kandongos Falls located 50 meters away from the road and six kilometers away from the town center.